The ultimate experience in paradise! Sailing with the wind with your own private catamaran, visiting hidden coves that few tourists ever see, snorkeling in marine preserves, sipping cocktails as the sun warms your skin, stopping to get a taste of small seaside villages, and sunning yourself on deck with only the sound of the ocean below you. See remote areas outside of Puerto Vallarta that few ever get to experience, or hit the main beaches and attractions all in one day. Your group will be treated to a deli lunch made fresh onboard by our chef, an all-you-can-drink PREMIUM open bar, delicious snacks and we can even supply roast chicken & salad (upon request) for a small additional charge. This is a perfect idea for a cruise shore excursion, particularly if you're traveling in a larger group, but also great for a day on the water for guests staying in Puerto Vallarta. Nothing spells paradise like sailing on a private catamaran, stopping in at a local beach and watching for humpback whales (in season) leaping out of the water alongside the boat. 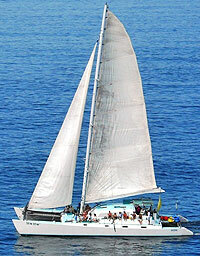 North Bay - Sail North along the bay, passing the beachside communities of Bucerias, La Cruz and Punta Mita. Snorkel at the Marietas Islands and see the rare blue footed booby. Duck into a hidden cove or isolated beach, or visit the artistic surfing community of Sayulita. South Bay - Snorkel at Los Arcos Marine Park, visit the isolated beaches of Quimixto, Las Animas, and Colomitos. Walk to waterfalls, hire watersports, or enjoy lunch at a beachside restaurant. Marietas Islands - Watch for whales (in season), dolphins, manta rays, and sea turtles on the way to this protected marine park. Snorkel in the Las Marietas marine preserve, explore caves, and snorkel some. Optional: Add Roast Chicken & Salad for 60 Pesos (About $5.00) per person. Just write your request in the special instructions box when booking. Duration: Half-Day (4 Hour) and Full Day (6.5 Hour) Charters Available. You can also do less time if you want to but the 4 Hour price is the minimum price. Departs From: Paradise Village Marina in Nuevo Vallarta. Pick-up is also available at the Opequimar Pier in Marina Vallarta and Marina de La Cruz de Hunacaxtle in the Riviera Nayarit (North Coast). Cruise Passengers: This excursion is flexible to fit all cruise ship schedules. Pick-up is available at the Opequimar Pier in Marina Vallarta, very close to the cruise pier. The Opequimar Pier charges a $3.00 per person use fee that must be paid in cash upon arrival. Alternatively, you can meet at Paradise Village Marina in Nuevo Vallarta (no fee).